Are you planning a visit to Milton Keynes for a short or extended stay and looking for comfortable temporary accommodation? If so, there are a number of things you should consider before booking your accommodation to ensure it meets your needs. Will you be arriving by car and need a secure place to park? Are you planning to host meetings with business colleagues or clients? Will you need a quiet place to sit and work? Then book into a one or two bedroom Theatre District serviced apartment in the heart of Milton Keynes town centre close to the popular Theatre:MK. Apartments are more spacious than the equivalent hotel room, have direct connection Wi-Fi, secure parking, DVD player, Sky with sports plus F1 motor and movie channels and utilities. All these ‘home comforts’ to help you feel more at ease when travelling. You will have a spacious living-room to relax in and watch a movie or grab the thrill of a sporting event on the exclusive SKY plus channel, read a book, entertain, listen to music or just sit back and day-dream. Apartments are big enough to separate your working and sleeping area. So, if you need to catch-up on emails or plan for your next business meeting, then you have the dining-room where you can spread yourself out at the table. When you are feeling peckish, you have a fully equipped kitchen complete with a full set of utensils and appliances so you can cook what you want when you want. 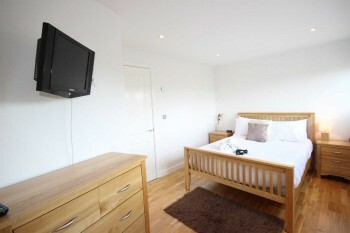 With the stylish furniture and wooden floors, the apartment offers a fresh, clean, homely feel. The floor to ceiling windows across the width of the lounge allow light to stream into the room while also offering a view from your armchair across the tree-lined roads and green spaces of Milton Keynes. You can host meetings, entertain and enjoy home comforts. There is a reliable broadband connection in each apartment. One secure parking bay is provided per apartment with plenty of off-street parking for visitors. You are also within a short walk to a host of restaurants, pubs, shops and many entertainment venues. 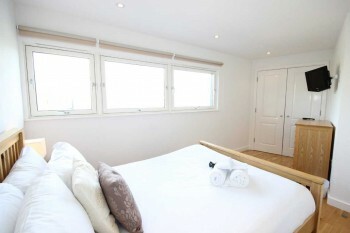 You will also find a bedroom with towels and a pair of complimentary slippers so can ‘kick-off’ your shoes and make yourself at home after a busy day. You have the option of catching-up on TV viewing in your bedroom too. Storage facilities are ample with a double-door wardrobe in the main bedroom plus there is a contemporary ensuite bathroom with bath and shower facilities. But, we are also aware that it is not just about the space and home comforts, there are other features that are important in deciding where to stay on a business trip. The nature of business is often such that plans may change or cancelled at short notice so flexibility is important. We pride ourselves on our customer service and will always be happy to make amendments to your booking wherever possible. There is so much more space than the average Hotel room that it will take the stress out of travel – especially for those on longer-term business assignments. Constrained no longer by fixed meal times and food you may not enjoy, you will benefit from the freedom a Cotels’ serviced apartment provides. 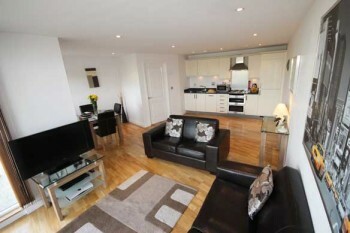 We offer an extensive range of serviced apartments at four Milton Keynes locations and two in Northampton.